Global Positioning System (GPS), has found itself as a gateway for the cutting edge technology for this century. It was designed and developed by USA during the late 19th century after recognizing its importance in military applications. Due to its accurate positioning capabilities and navigation and timing services it was later open for civilian uses as well. â€¢ A plan for the extent of GPS data. Some plans provide all informationâ€™s about the locality you are in. While other plans are used only to track your position. â€¢ A service plan to provide the phone’s location. â€¢ Satellites around the Earth which provides your exact position using “Trilateration”. Basically a GPS receiver comprises of a receiver, and the help of the 27 earth-orbiting satellites, which rotates in the medium earth orbit. Out of these 27 satellites only 24 are in use and the rest is kept as backup for any failed satellite. Suppose you want to know your exact position using GPS, the receiver determines the exact locations of a minimum of 3 satellites above you and also your position with respect to the satellite. Then a method called “Trilateration” is used to find your exact location. These satellites make two complete rotations around the Earth everyday. So, a minimum of 4 satellites are assured to receive the GPS signals. When the receiver sends the signal to locate itself, it finds out three nearest satellites of known positions. The receiver then calculates the distance between one satellite and the receiver. If the distance is “X”, then it draws an imaginary sphere with “X” as the radius from the receiver to the satellite and also the satellite as the centre. Similarly, the same process is repeated for the next two satellites. Thus three spheres are drawn with just two possible positions. Out of these one point will be in space and the other will be the location of the receiver. Thus the exact position of the receiver is found out. Usually the receivers try to locate more than four satellites so as to increase the accuracy of the location. The Earth is made as the fourth sphere so that two points converge with the imaginary spheres of the other three satellites. This method is commonly called 3-D Trilateration method. Just as phones use radio signals, the satellites also use low power, high frequency radio signals so as to compute the location of it with respect to the receiver. They are also used to compute the distance between the device and the satellites. The distance is calculated by knowing the time it took to reach the receiver. As explained earlier, to find the distance and locations of the satellite and receiver, the parameter time is computed. At a time ‘t’, a pseudo-random code is transmitted from the satellite. At the same time the receiver also starts running the same pseudo random digital pattern. But there will be a time-lag, when the signals from the satellite reaches the receiver. The signal’s travel time will be equal to the length of this delay. When this time is multiplied by the speed of light, the distance between the satellite and receiver is obtained. For this method to work properly, accurate clocks that can read a small time as nanosecond is required in both the receiver and satellite. But these type of atomic clocks are rather expensive and so cannot be bought by all types of consumers. The only problem to this solution is to use a quartz clock and an atomic clock. The atomic clock will be mounted on the satellite. The quartz clock will be used in the GPS. he speciality of this quartz clock is that it constantly resets. 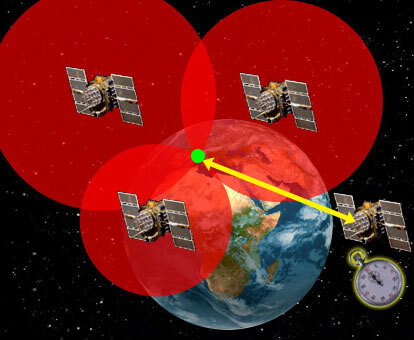 Thus, when multiple signals from multiple satellites reaches the GPS the clock in the GPS will gauge its own inaccuracy. Thus only one current value will be used by the receiver, which causes the incoming signals to contradict at a single point in space. That time value is held by the atomic clocks in all satellites. Thus the time value of the receiver clock and satellite clock will be the same. Though this method is not as accurate as keeping two atomic clocks you will get almost 99% accuracy. Thus you get the distance between the satellite and receiver. Getting the location of both the satellite and receiver is easier. This is because the satellites travel at much predictable orbits. So, the GPS has an “ALMANAC” which stores the data referring to where a particular satellite is positioned at a particular time. Though the positions change with respect to the pull of the moon and sun, this is monitored by the Department of defence and is updated to the GPS receivers. Though all these methods are used there may still be an inaccuracy of (5-10) meters. This can be reduced only by upgrading the satellites. This is because, the radio signals from these satellites will be affected by the ionosphere. But, this accuracy (5-10)meters was obtained only because of Differential GPS. Though the radio signals are known to have the speed of light, it will be reduced as it goes through the ionosphere and the troposphere. The radio-signal delay can also depend on your position. Bad data from the satellite itself. Using Differential GPS all these errors can be corrected. For this a stationary receiver is introduced. This receivers location is also known and is used to gauge the inaccurate data. This corrected signal is then provided to all the other Differential GPS equipped receivers and thus the signal is corrected. Differential GPS (DGPS) helps correct these errors. The basic idea is to gauge GPS inaccuracy at a stationary receiver station with a known location. 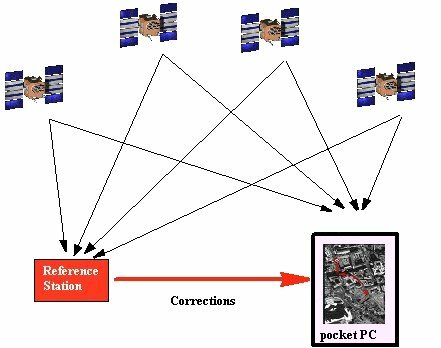 Since the DGPS hardware at the station already knows its own position, it can easily calculate its receiver’s inaccuracy. The station then broadcasts a radio signal to all DGPS-equipped receivers in the area, providing signal correction information for that area. In general, access to this correction information makes DGPS receivers much more accurate than ordinary receivers. The raw data output from the GPS is mostly in latitudes and longitudes. But this is further converted into map data with the help of map files stored in the memory of GPS. Apart from our location GPS also helps us to find the distance we have travelled from one point to your current position. It can also tell the time you took to reach that distance. It can also act as a speedometer, and display your average speed. The size of the circuitory of GPS receivers are very small and so can be taken to any place. Though the satellites are capable of providing the GPS service for all countries, most countries prefer to stay independent. Most countries are on the verge of launching their own satellites. India is launching a satellite called IRNSS by 2012. Russia has its own satellite called GLONASS. Europe will launch their famous Galileo system by 2013. This is a clear indication that GPS has been accepted all around the world. I wanna build a GPS, so I can find some ice cream! Ummmmm, Ice Cream! I keep looking for an ICE-CREAM circuit,,,I can’t find one! 19th Century????. Are you sure???? The same Century when Maxwell, Tesla, Edison, Marcony etc. began with electricity and RF ? Perhaps you meant 20th, today we “are” in the 21st. Besides this little mistake, itÂ´s a great article. thanks a lot for the up dates pliz.